We live in a world seemingly driven by competition. We compete for grades. We compete for jobs. We compete for pay. We compete on the road in rush hour traffic, we compete for dates for a night on the town. We compete to get benefits, entitlements, the attention of loved ones, recognition and rewards. We even compete in sports. And with competition comes the primal emotions of the human struggle: aggression, ruthlessness, malice, rage, ferocity, pride, vanity, ambition, obsession, brutality. The darkest aspects of our psyche, evolved through the millenia in the ultimate competition for survival. And in the chaotic milieu of the human race, they often grow to consume us, until our lives seem to be nothing more than our most primitive selves. The Vikings thought this way once. They lived it. For theirs was a worldview driven by the maxim: "The gods are doomed and the end is death." Given the promised apocalypse of Ragnarok, the only life was the life lived now, the only rewards were the rewards taken now, the only treasures were the treasures seized now. They lived their lives as the supreme competition for survival. And their brutality and ferocity were renowned. Somewhere along the way, however, they changed. Sometime after their conversion to Christianity, their worldview gradually shifted to one of hope, and to a promise of better things. Part of this was the adoption of a peculiarly Sicilian tradition of Santa Lucia. 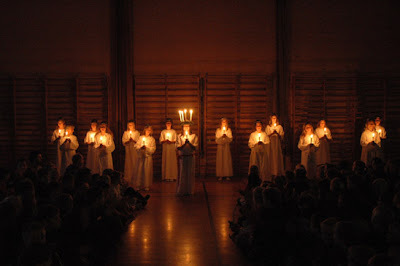 In the Scandinavian permutation of Santa Lucia, girls dressed in white and wearing crowns of lit candles arose in the darkness on December 13 to deliver food to friends and families as well as the starving and the poor. In Sweden, the festival of Santa Lucia was (and still is) taken as an expression of charity and compassion. Symbolically, it is also meant to be the act of bringing light to the earth upon the darkest day of the year. In many ways, on so many levels, Santa Lucia is entirely antithetical to the ancient Viking way. But this is perhaps by design. Because the Vikings realized that the only thing competition had gotten them was blood and death. They realized that life had to be more than just primal emotions and primitive psyche. They realized that it had to be about other things, like dignity and compassion. Because a life lived by words such as aggression, ruthlessness, or brutality is a life lived in darkness, and a life lived in darkness is pointless. Because what people need during the darkest times in our lives isn't more blood and death and promises of destruction, but a sense that things can get better--not to deny the reality of this world as it is, but to show the potential of the world as it can be. In short, what people need is hope.